Set between the 10th and 15th championship fairways within the magnificent Mount Juliet Estate, the Paddocks is an exclusive courtyard-style development . . .
Set between the 10th and 15th championship fairways within the magnificent Mount Juliet Estate, the Paddocks is an exclusive courtyard-style development, offering peace and tranquillity in a place of great beauty. While the homes share some common characterisitcs each one is decorated and furnished with individuality and a style that relflects the owners personal taste. The accommodations are spacious and welcoming, with balconies and terraces that provide views across the Jack Nicklaus designed fairways. Surrounding the homes are 1,500 acres of woodland, pasture, formal gardens and fishing on the River Nore which flows through the estate. Activities include; clay target shooting, archery, tennis, croquet, snooker, a golf academy, riding trails, cross-country arena, and a health spa and gymnasium, all available for guests use. 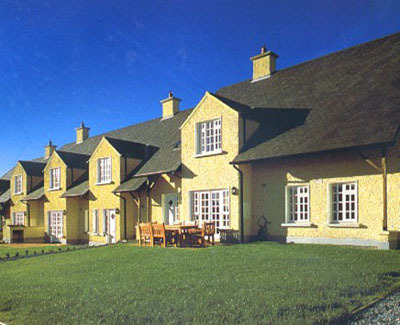 Thomastown is the perfect location for a fun, active, yet relaxing vacation. Though these two and three bedroom homes share some common characteristics, each one is decorated and furnished with individual flair and reflects the taste of the owner.Whether you choose a two or three bedroom lodge you will find the accommodation spacious and welcoming, with balconies and terraces that provide views across the Jack Nicklaus designed fairways. Enjoy 1,500 acres of unspoilt woodland, pasture, formal gardens and fishing on the River Nore which flows through the estate. Clay target shooting and archery facilities are available, as are tennis, croquet, snooker and golf academy. Nearby, in the Hunters Yard, there is a health spa offering a heated swimming pool and a well-equipped gymnasium. The sauna, steam room and diverse range of body therapies make the spa the ideal spot to recuperate after a days hectic sporting activity. Also on the estate are two restaurants and a bar. The equestrian centre caters for beginners and more experienced riders with miles of riding trails, a cross-country arena and an outdoor all-weather arena.